The States of the Atlantic slope of the Union had been settled for more than a century; the aboriginal inhabitants had almost entirely disappeared from their territories; the great centres of commerce had been steadily increasing in magnitude and wealth; agriculture had extended itself; and, with the stability given to society by a government wisely administered, our institutions were gradually becoming consolidated and developed,-- when the commencement of the convulsions in Europe directed a new course of emigration to our shores. If among the early settlers there were idle adventurers seeking to become rich by the fortunate discovery of mines of the precious metals, it had long been settled, that, in the vast country lying east of the Alleghanies, the reward of wealth was bestowed only upon industry; and "Poor Richard" had condensed for his "Almanac" a " way to become rich," which was but the expression of the experience of the people. The new tide of immigrants which the intolerance of European Governments, the convulsions of society, and the rapacity of landholders now cast upon our shores, came literally for a home. Willing, in the vast majority of cases, to labor, they asked only for themselves and those most dear to them that their labor should give them support; and they looked forward to gathering their families around them in homes owned by themselves, and purchased by their toil. In the progress of the last sixty years, our country shows abundant evidences of the labors of these new fugitives from European oppression, -- in the network of canals and railroads which intersect in every direction the states east of the Mississippi; in the great public works of the country; in the buildings of our cities and, though to a less extent, in the new openings which have been made into the wilderness, and the new states which have grown up on the borders of the great lakes and far to the West, beyond what was at the commencement of the century the extreme exploration of the pioneer and the hunter. The census of the United States for 1850 gives the following statistics, which show to what extent our population has in this way been increased. It should be borne in mind however, that, invaluable as they have been as laborers, their social and political influence, and the impression they have made upon the mental and moral character of our institutions, have been by no means in the ratio of their numbers. Only a comparatively small proportion of those arriving here are even naturalized, while the vote is only about one-fourth of that of a native population of the same number. About one-third of those who arrive remain in the cities. In 1790, the entire population of the United States was 3,929,827; in 1850, it was 23,263,488, -- showing an increase of about 19,000,000, of which the proportion due to immigration and its increase is a little over one-fifth. The census now being taken will probably show the proportion to be much less during the last decade. The few pilgrims of the humble May Flower hardly conceived at their "Landing," 21st of December, 1620, of the grand and crowded emigrant ships of the present day, and of an empire, of which they were the Founders, stretching, with ever widening extent, from Plymouth Rock to the shores of the Pacific! 1. 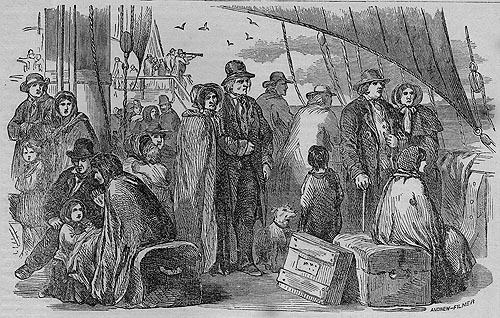 "Immigration Into the United States," The Illustrated Pilgrim Memorial, 1863, page 31.